Nikon's latest flagship DX-format digital SLR combines professional-level performance with agility and enhanced D-Movie capabilities to deliver a new measure of creative versatility. TOKYO – Nikon Corporation is pleased to announce the introduction of its new DX-format digital SLR flagship, the Nikon D300S. As well as inheriting the finest features of the highly acclaimed D300, the D300S boasts many innovative enhancements and is designed to meet an even broader scope of creative demands from serious photographers. First and foremost, the D300S possesses the superb product quality required of the flagship of Nikon's DX-format digital SLR camera line: 7 frames-per-second*1 high-speed continuous shooting, exceptional accuracy thanks to the 51-point AF system and approx. 100% viewfinder coverage, plus dual card slots and the rugged durability that enables the camera to work under extreme conditions. What's more, an enhanced D-Movie function provides new features, such as an external microphone input for stereo sound recording and AF capability with contrast-detect AF during movie recording. Such outstanding specifications in a trim, responsive, versatile DX-format digital SLR will give any serious photographer an extra measure of agility, for traveling and shooting with greater ease. On top of this, users can choose from the extraordinary range of more than 60 NIKKOR lenses, and Nikon's Total Imaging System — benefits that give the D300S a special advantage in terms of creative D-SLR versatility. One major advancement of the D300S is its ability to shoot as fast as 7 frames per second,*1 with Rechargeable Li-ion Battery EN-EL3e (included), and up to 8 frames per second*2 when using the optional Multi-Power Battery Pack MB-D10 and Rechargeable Li-ion Battery EN-EL4a. It also offers a rapid startup time of approx. 130 milliseconds and an amazingly short shutter release time lag of only 49 milliseconds*1. *2Based on CIPA Guidelines. Battery Chamber Cover BL-3 required for Rechargeable Li-ion Battery EN-EL4a. The D300S's advanced D-Movie function benefits from a number of functional and technological advancements, including an external stereo microphone input enabling high-fidelity audio, plus in-camera movie editing, allowing the trimming of clips. And in Tripod mode, the D300S features contrast-detect AF. Yet another means of enhancing the dramatic impact of HD video is by taking advantage of the wide selection of finest-quality NIKKOR interchangeable lenses — from ultra-wide-angle and fisheye to super-telephoto — for incredibly sharp results. What's more, the camera's versatile Picture Control adjustment options let you modify the tone and color of HD video clips with remarkable ease. The D300S's Multi-CAM 3500DX AF sensor module provides an exceptionally wide area of AF coverage. With 51 AF points densely positioned across the frame, it's designed to capture your subject accurately, even when its movement is unpredictable. Moreover, it utilizes 15 powerful cross-type sensors in the center of the frame to give you the ultimate in detection performance with any AF NIKKOR lens of f/5.6 or faster. You can also choose to shoot with 11 focus points. The 51 AF points are employed in various focus area modes, according to subject conditions. Single-point AF mode allows you to choose a single AF point from among the 51, and in dynamic-area AF mode, you can select from 9, 21 or 51 AF points. The 51-point option offers 3D-tracking mode, which automatically shifts the focus point to match the subject's movements. Auto-area AF mode specializes in focusing on people, automatically detecting and prioritizing skin tones with all 51 points. The D300S's viewfinder features an eye-level pentaprism with approx. 100% frame coverage and approx. 0.94x magnification. The large, bright viewfinder makes for easier, more accurate composition. 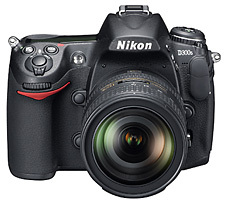 The D300S employs Nikon's renowned DX-format CMOS image sensor that provides 12.3 effective megapixels. It delivers extraordinary image quality throughout a wide ISO sensitivity range of ISO 200 to ISO 3200 with low noise. In addition, Lo 1 for ISO 100 equivalent and Hi 1 for ISO 6400 equivalent are also available. Initial image capture data can be quickly and accurately transferred using 14-bit integrated A/D conversion. All successive internal processing is then handled at a full 16 bits. The resulting output reveals breathtaking details and remarkably smooth tonal gradations. Nikon's comprehensive EXPEED image processing utilizes an accumulation of sophisticated Nikon intelligence and technologies to ensure impeccable quality for both still images and movies, while also achieving high-speed processing and low power consumption. It also effectively reduces lateral chromatic aberration. Nikon's intelligent and exclusive light metering sensor applications have undergone a refining process that has led to a breakthrough technology, the Scene Recognition System, which uses precise color and brightness information from the 1,005-pixel RGB sensor to push accuracy levels for autofocus, auto exposure, i-TTL flash control and auto white balance to an unprecedented level. And in playback mode, the added Face Detection System lets you instantly zoom in on a human face in the high-resolution, 920k-dot LCD monitor. New for the D300, the D300S provides dual card slots, enabling the simultaneous use of both CompactFlash* and SD memory cards and allows photographers to designate the primary recording slot. For the slot designated as secondary, photographers can select from three recording methods: "Overflow" recording lets you use the memory capacity of the secondary card when the primary card is full, automatically; "Backup" recording stores the same images on both cards; and "RAW primary, JPEG secondary" recording lets you record RAW data and JPEG data separately to each card. You can also copy images between the two memory cards. And when shooting D-Movie clips, it allows you to select the slot containing the card with the most available capacity. One more advancement over the D300 is that by selecting "Q" on the release mode dial, photographers can opt to substantially reduce the sound of the camera's mirror-down during shooting. This is particularly useful when shooting in restrictive conditions such as when photographing wildlife. By localizing tone control, Active D-Lighting accurately restores the details in shadows and highlighted areas which are often lost in high-contrast lighting situations. Simply choose the appropriate setting — auto, extra high, high, normal, low or off — prior to shooting. For further options that will help you achieve your desired tone, the D300S also allows you to bracket your pictures with varying strength levels, for up to five frames, perfect for difficult lighting situations or if you don't have the time or experience to select just one Active D-Lighting setting. Nikon's Picture Control enables you to create the pictures you envision, quickly and easily, by making specific selections and adjustments to image sharpening, contrast, brightness, saturation and hue. And with other Picture Control-compatible cameras, as long as the settings are the same, you're able to obtain the same picture tone. The D300S offers four preset Picture Control options — Standard, Neutral, Vivid and Monochrome. Your can also download two additional presets, Portrait and Landscape, from the Nikon website. With a guide number of approx. 17/56 (m/ft., ISO 200, 20°C/68°F) and 16mm lens coverage — wider than the 18mm of the D300 — the high-performance built-in flash supports Nikon's original i-TTL flash control that evaluates flash exposure with greater precision for exceptional results. Compatible with the Nikon Creative Lighting System, the built-in flash controls up to two groups of remote units as a master/commander in Advanced Wireless Lighting. The optional Multi-Power Battery Pack MB-D10 supports three types of batteries: R6/AA-size batteries, along with Nikon's Rechargeable Li-ion Battery EN-EL3e and Rechargeable Li-ion Battery EN-EL4a. It combines added stability with extended shooting of up to approx. 2,950 shots*1 per charge and enables faster high-speed continuous shooting at up to 8 fps*2. *2Based on CIPA Guidelines. When Rechargeable Li-ion Battery EN-EL4a and Battery Chamber Cover BL-3 are used for the Multi-Power Battery Pack MB-D10, all of which are sold separately. Nikon's Integrated Dust Reduction System including Image Sensor Cleaning function that provides effective dust reduction. With the optional GPS Unit GP-1, location information such as latitude, longitude, altitude and time are automatically recorded to each image's Exif data. *With a battery other than Rechargeable Li-ion Battery EN-EL4a, the continuous shooting speed may be slower than 8 fps in continuous high-speed mode.